Uskowi on Iran - اسکویی در باره ایران: A Russo-Iranian strategic axis? The Kremlin said President Vladimir Putin signed a decree ending a self-imposed ban on delivering the S-300 anti-missile rocket system to Iran, removing a major irritant between the two after Moscow canceled a corresponding contract in 2010 under pressure from the West. A senior government official said separately that Russia has started supplying grain, equipment and construction materials to Iran in exchange for crude oil under a barter deal. Iran’s Defense Minister Brigadier General Hossein Dehqan said Russia’s decision to lift the ban indicates the political will of the two countries’ officials to improve cooperation in all fields. Iranian Defense Minister Brig. Gen. Hossein Dehghan received an official invitation from Russian Defense Minister Sergei Shoigu to speak at the International Security Conference to be held in Moscow on April 16 and 17, 2015. IRIN Rear Admiral Ali Shamkhani met with Russia’s Secretary of the Security Council Nikolai Patrushev in Moscow. Secretary of the Supreme National Security Council referred to Iran-Russia collaboration efforts. Shamkhani stated: "The principled policy of the two countries in enhancing regional cooperation and balancing the transferable capacities in the diverse political, economic and security spheres has had a decisive role in the management of security crises across the region." The Russian President Vladimir Putin’s decision today to sign the presidential decree to forthwith supply S-300 missiles to Iran and the reported commencement of the $20 billion oil-for-goods swap deal between Russia and Iran effectively signifies the end of the sanctions regime against Iran. Putin has “liberated” Iran from the curse of sanctions. The Kremlin de facto opened the floodgates for Iran’s integration as a full-fledged member of the international community. Indeed, the ramifications of today’s development, signifying the coming into being of a Russo-Iranian strategic axis, are going to be profound on several theatres of international security in a wide arc stretching from Central Asia through the Caucasus and the Caspian to the Middle East proper. Simply put, the US is staring at a catastrophic setback in its regional policies on several fronts. Without doubt, Iran is a pivotal state and it is a game changer for Russian policies to have such a regional power on its side as a close ally. Conceivably, Moscow and Beijing are coordinating their moves on Iran. The Chinese President Xi Jinping is due to pay a visit to Iran at an early date and Chinese officials had openly hinted that there could be some “dramatic” announcements during the visit. For sure, Iran has taken a great leap forward toward induction into the Shanghai Cooperation Organization. COMMENTARY: It has become increasingly evident that Iran is benefitting from tensions between the United States and Russia, over developments at Ukraine. The Iran nuclear negotiating team at Lausanne displayed an unusual sense of confidence, going so far as to remain steadfast before an impending deadline. Perhaps this confidence was provided by Russian assurances. Flynt and Hillary Mann Leverett have described the Iranians as "not putting all their eggs in the American basket," with regards to nuclear negotiating. In addition to today's announcement by the Kremlin that it is prepared to deliver the S-300 long-range SAM system to Iran (with some sources claiming an "upgraded variant"), Russia also announced its first export sale of the S-400 Triumf mobile SAM system to China. Of special interest for 14APR15 will be whether or not Russia vetoes the impending UNSC resolution on the Yemen conflict; a resolution which effectively supports the Saudi-led coalition in the war against Ansarullah and Pro-Saleh forces. Amid the current flurry of diplomatic activity observed between Iran and Russia, were the Russians to veto the resolution it may follow what would appear to be Foreign Minister Zarif's successful lobbying effort last week in Pakistan, where the Pakistani parliament elected to remain neutral during the Yemen conflict. The sale by Russia of S-300 systems to Iran and the expected start of the oil-for-goods barter agreement, worth $20 billion, which involves Russia buying up to 500,000 barrels of Iranian oil a day in exchange for Russian equipment and goods, are the most significant moves by Russia to strengthen Iran’s military and economy in recent times. But as significant as these developments are for Russo-Iranian bilat relations, they are more the manifestation of the worsening U.S.-Russia relations than Russia-Iran strategic alliance. After all it is the same Russia which put a hold of the delivery of S-300s to Iran and kept delaying the barter agreement until now when their relations with the U.S., mainly over Ukraine, has hit the lowest point since the fall of the Soviet Union. Again, no matter what the motivations of Russia in these latest moves are, of course the news of S-300 and the barter deal are great news for Iran. But the Iranians should not be carried away, reading these moves solely in the context of Russia-Iran relations. The expected veto of the UNSC resolution on Yemen could also been seen as more a move against the U.S., as in the old days of the Cold War, and less in favor of the Huthis and Iran as their supporters. The immediate effects of all this might be the same. But knowing the context under which Russia is moving the way it is on these issues is as important to gauge their long-term effects. Putin not to be outdone (by selfie pictures taken by Iranian with Obama’s picture in the television set) released S-300. Agreement or no agreements the report says states within United States are acting on their own to keep the sanction on Iran by restricting investment of pension plans in companies dealing with Iran. Israel succeeded keeping the de-facto sanction on Iran well into the future preventing rapprochement. They know they would lose the competition between pro American Iran and pro American Israel. Israel pro American has dollar value attached to it while Iran pro American is free of charge and due to shared national interest. Croker and Mendez and alike heavily subsidized by Jewish lobbyist selling their country. Hell even Israel ambassador is American citizen. Iran has antiquated arms to defend itself in a rough neighborhood. They pushed Iran right into Russian hand. That arm industry would be still selling arms to the usual customers they buy oil from to counteract Iran Russia axis. So either cold war is back or until Russian will go off the sanction list with the new reset button. Then the Russian will stab Iran in the back again. Over 1/3 of Israel residents are immigrants. It is a sad event for those Iranians hoping a rapprochement with USA. One of the new bipartisan agreement includes sanctions to be put back on Iran if there are any terror activity by Iran against United States. Terror activity can be proven as easy as yellow cake, Niger connection, whatever have you. Are you absolutely agree with nonsenses too ?? Medvedev had apparently read Uskowi's worries in 2010, that the Us-israeli relation went to the lowest points (because the usa did not want to go or support israeli bombardment of Iran at that time), and after additional brainwashing by H. Kissinger, who went on an explorational visit to Moscow at that time with a group of mostly jewish ancestry american conressmen,and where he talked to Medvedev for more than 8 hours personally, as well as after inputs from netanyahu, Medvedev cancelled the S-300 deal. So it was not a decision of Putin or significant majority of Russian politicians, but Medvedev's personal decision, which was desired by authors of this website, who almost prayed daily for a war against Iran at that time. When Mr. Medvedev made his decision to cancel the S-300, he was influenced by aforementioned events as well as that he as a president at that time, had another vision for cooperation with the West, which was cleverly exploited by the West to sow a rift between him and Putin, and prevent the latter (Putin) from a running for the third term. on a basis that it is unconstitutional and that Medvedev should challenge that fact and bring true 'democracy'. To my best knowledge VP J. Biden and former ambassador Faul championed strongly those ideas at that time. When, Medvedev started his travel around the world,. he was was suggested by leaders such as M. Gaddafi to open naval base in Benghazi and on an Venezuelan island by H. Chavez, as well as by Cuban leaders to expand Russian presence on their territory. With his age; he is almost 15 years younger than Putin, he makes progress in a learning of political experience. Most of Russian leaders, who are linked to Jewish ancestry, have better understanding of the future developments in the world, than those who decided to 'escape and preach' from and for the West,. 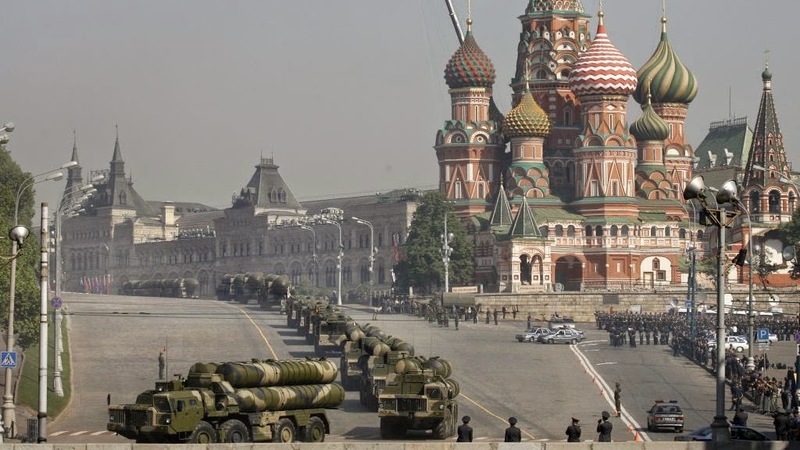 The cancellation of the S-300 had also in part a silver lining, because it stalled some western decisions like open pursuit of military action against the Islamic Republic and arming rebels in Syria or invading it.